Walk In Shower Base with Surround Panels, matching ramp and accessories available. Center drain. Walk In Low Profile Shower Bases available individually or with Shower Wall Surround Panels. Optional Accessories: Add-A-Ramp, 2" Drain, Corner Trim, Rubber WaterStopper, Weighted Shower Curtain. Over 50 Premium and Standard Granite Colors available. Finishes: Standard Granite Color Gloss, Premium Solid Color Gloss and Premium Matte Finish. Please refer to the Color Selection Chart when ordering your shower. Gloss Finish: Gelcoat on the surface (about 15 mils) similar to cultured marble - ISO-NPG polymer. ISO-NPG gelcoat is a tight molecule--very resistant to water penetration. Premium Color Gloss Finish: WHITE, BISCUIT, BONE, SNOWSWIRL. MATTE Finish: The surface is lightly abraded to achieve a uniform matte finish and then sealed with a Matte Surface Sealer. It is recommended to use Gel-Gloss Maintenance Wax more often on Matte Finish. 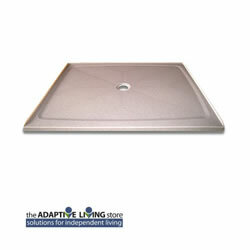 Add-A-Ramp turns a Walk-In Low Profile Base into a wheelchair accessible shower. Add-A-Ramp can remain removable or attached permanently. If your Add-A-Ramp needs to be a different height than your Low Profile Base, please specify finished height when ordering. Corner Trim - 2 trim pieces for left and right vertical panel joints. Corner Trim is used for accent or as filler when framing is out of square/plumb. Weighted Shower Curtain works with the Rubber WaterStopper to minimize wet floors. Color matched Vanity Sink Tops available. Curb height is 1-3/8” tall. Showering area has a 1/4” per foot slope toward drain. Shower Wall Panels are 3/8" thick with solid color throughout. Panel weight approximately 3.5 lbs per square foot. Adhesive and color-match silicone included. Easy clean with a 50-50 mix of white vinegar and water, or any non-abrasive cleaner. The finish is easily maintained with Gel-Gloss Maintenance Wax. "YES! GUARANTEED FOREVER" The Manufacturer has a simple, clear guarantee, "If our product ever fails, we will either provide you with a new item or refund the cost." Installation Note: Installer must verify that the floor is firm and structurally sound. If the floor has any flex the installer must add support where needed. Installer must verify that the floor is level, flat and clean (all nails and screws must be countersunk). When installing the wall panels, installer must dry fit prior to applying adhesive. If necessary, surround panels can be trimmed prior to installation. Please note: Wheelchair Accessible Showers are custom ordered and once ordered, cannot be canceled, refunded, returned or exchanged. Please note: Lead Times are seasonal, 2-4 weeks production. Please contact an Adaptive Living Store representative for current lead time. Please note: This item ships via Freight. Freight services include: Notification Prior to Delivery; Residential Delivery; Delivery to Jobsite. Additional fees may apply based on delivery arrangement.